Uniform temperature, closed, live-cell environmental chamber. 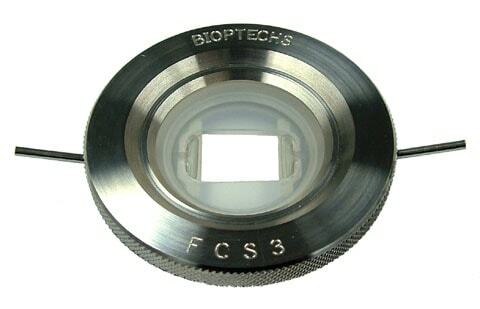 The Focht Chamber System 3 (FCS3) is a live-cell micro-observation system specifically for upright microscopes. It has all of the optical, thermal and fluidic capabilities of its predecessor the FCS2. 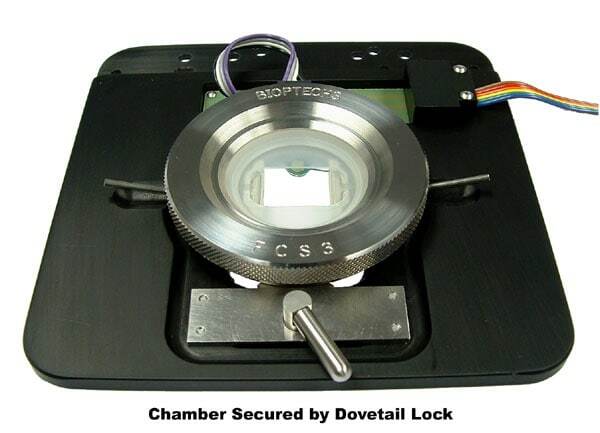 Therefore, it provides compatibility with all modes of microscopy, uniform temperature control throughout the observation aperture, a near laminar flow that is adjustable to provide the user with the ability to modify the separation of optical surfaces, flow path geometry, and fluid volume. The FCS3 was designed to maintain accurate thermal control and allow near laminar flow perfusion. 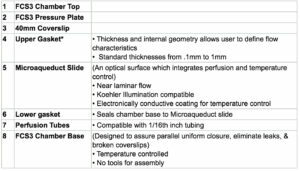 Both of these functions are incorporated into our patented Microaqueduct Slide (see drawing below). The surface of the slide, opposite the specimen side, is coated with an electrically conductive transparent thin film of Indium-Tin Oxide (ITO) and two electrical contacts (busbars). When the FCS3 is completely assembled and placed on the stage adapter, two electrical contacts and a thermal sensor, (not shown in drawing), rest on these busbars. A temperature controller is used to pass a regulated current flow through the ITO Coating. This causes the surface of the slide to heat. 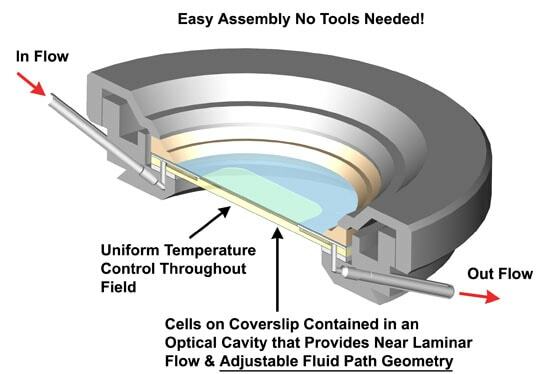 The heat is transferred through the media to the cell surface on the coverslip thereby providing a conductive heat transfer. The metal base of the chamber is also temperature regulated to provide heat to both the incoming media and peripheral thermal support to the metal housing. Microaqueduct Perfusion: A fluid pathway is formed by separating the Microaqueduct slide from the coverslip containing cells with a single silicone gasket. This gasket can be any thickness from 50 micron to 1mm and any lateral geometry you choose or create. This arrangement allows the user to define the flow characteristics. Therefore, you are not limited by the geometry of the optical cavity instead you select or create it! Fluid access to this flow channel is made through two 14-gauge needle stock tubes protruding from the sides of the chamber top. These tubes provide fluid connection to two perfusion holes in the Microaqueduct slide that interface two “T” shaped grooves cut into the inner surface of the Microaqueduct slide. The “T” groove allows the media to seek the path of least resistance and become nearly laminar before flowing across the cells. This technique eliminates the need for the metal perfusion ring and additional gaskets, which are the limiting factors, required by most conventional chambers. as a solid to improve contrast to illustrate function. By simply changing this one gasket you can change the volume and flow characteristics of the chamber. This gasket can have any internal geometry you desire and can be any thickness from .1mm to 1mm. The drawing below shows the standard shapes of the gaskets that we include with every FCS3. We also include solid gaskets for you to custom cut to your application. 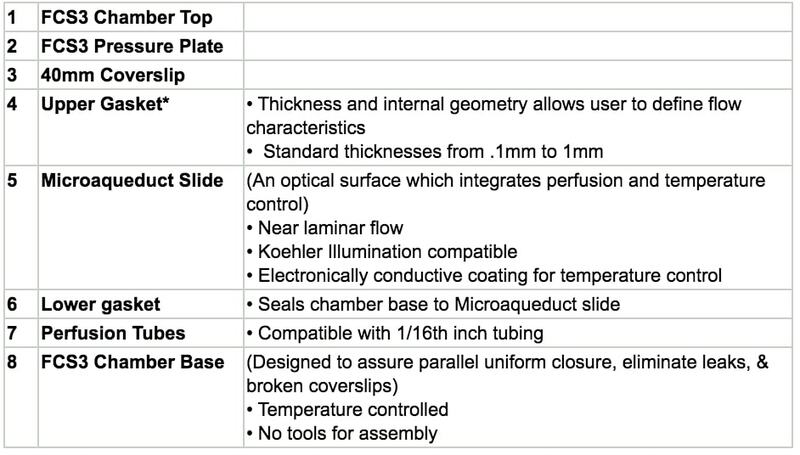 Examples of standard gasket outlines (below).